Landing number 2169; A Landing A Day blog post number 597. Dan – Oh my. I just hit a three run homerun! 1) My second eastern landing in a row, 2) my Score is now back below 150 where it belongs and 3) I’ve ended the streak of 34 landings at 4/10 or less. Why? Because of this USer . . . PA; 28/32; 5/10; 1; 149.5. Note the “1” – that’s the beginning of keeping track of the number of times in a row that I’m 5/10 or greater. How about that! 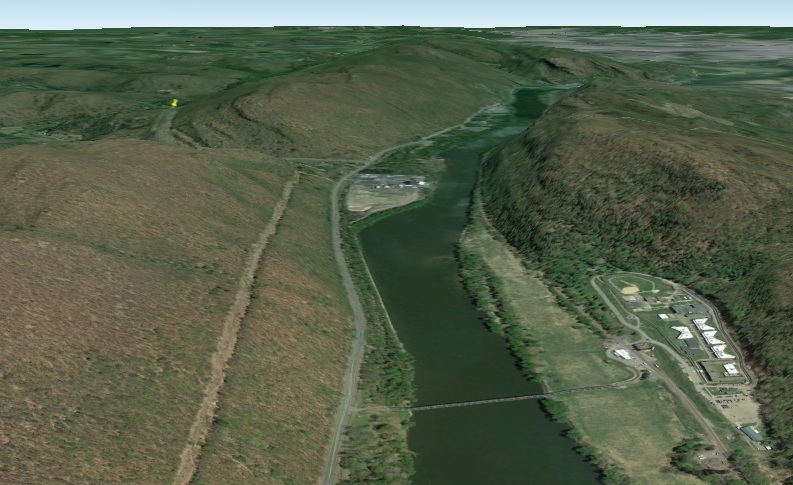 The GE map shows all of my landing locations since January 2013, and this was my first one in PA! In fact, my last Pennsy landing was #1967, back in October 2011! Also – look how isolated this landing is? It’s between 125 & 200 miles to get to neighboring landings! Unfortunately, the only GE Street View coverage is the road along the river. Unfortunately2, you can’t really see the mountain gap at all from the road. Unfortunately3, you can’t really see Hunlock Creek from the road either. Total aside: Chris Sanfino again! He has made appearances in these posts: Mackay ID, NJ Pine Barrens, Twin Falls ID, and Colchester CT. That boy gets around . 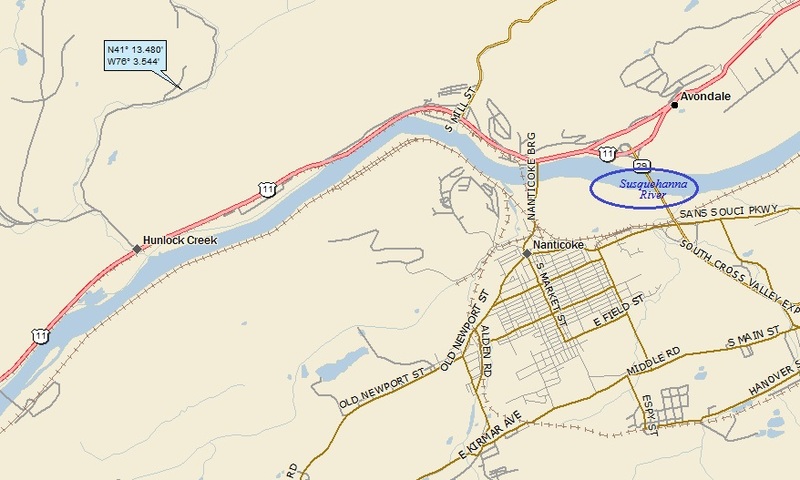 . .
Moving right along – my mother’s family homestead was in Belvidere, a river town about 12 miles south of the Gap (not far from where Chris Sanfino’s picture was taken). I visited relatives there often as a kid, and actually ended up graduating from Belvidere HS. I always loved the drama of the Gap, and, even as a kid, was curious about how the river could cut such an abrupt gap in that that massive ridge. The same collisions also cause the strata to be uplifted to well above sea level. Eons of erosion bring the whole kit and caboodle down to close to sea level, and flatten the landscape out. This is called a peneplain. The tops of the wrinkles get cut off. If you looked down on the landscape and could see the different rocks, you’d see strips of limestone, strips of shale, strips of sandstone. Streams and rivers are making their way across this low-lying plain. The entire landscape was lifted up to well above sea level by mysterious (at least to me) tectonic forces. As uplift was occurring, the streams & rivers could cut straight down, even cutting down through the really tough sandstones. Where the stream or river cut across sandstone: Voila! A water gap cut in the middle of a long ridge. Follow that? I did my best to keep it concise and clear without too much detail. 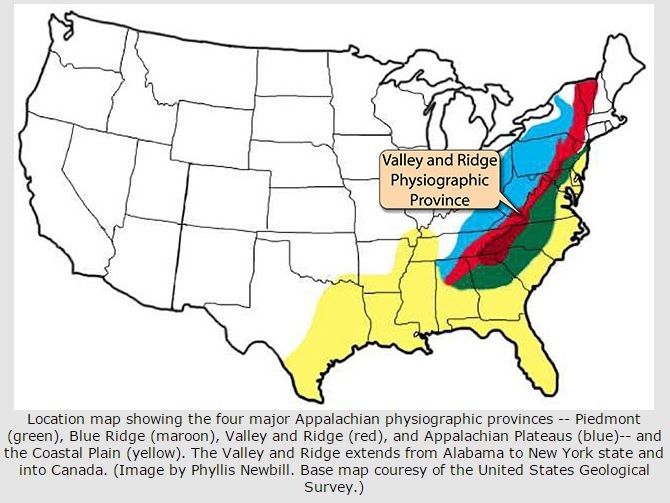 By the by, the ridges and valleys that were formed as described above are the Valley and Ridge geologic province. The second theory (which has to do with “stream capture”) isn’t intuitive to me, so I won’t even bother trying to explain it. Anyway – there are dozens of similar water gaps not only in PA (which includes the one next to my landing), but up and down the Ridge-and-Valley Province of the Appalachian Mountains (all the way down to the Carolinas). 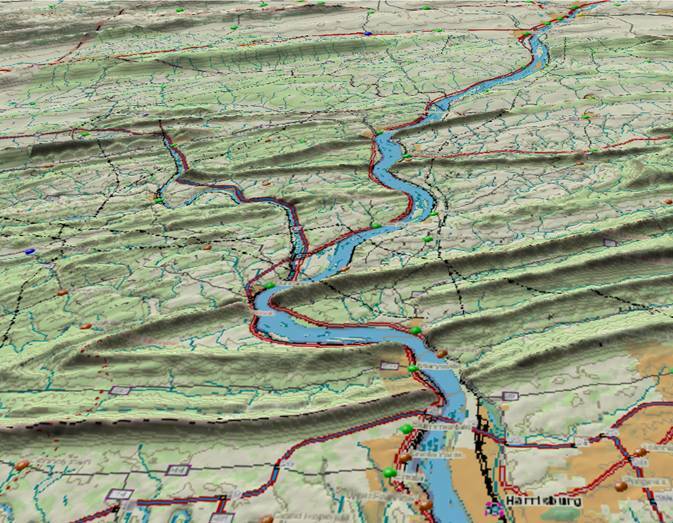 Maybe, just maybe, the Hunlock Creek (like the Delaware River) was one of those ancient streams flowing on the peneplain, making its way across a sandstone unit. Click HERE for the entire post (highly recommended, because he’s a peneplain guy!). So, I landed next to Nanticoke, which is next to Wilkes Barre which is next to Scranton. 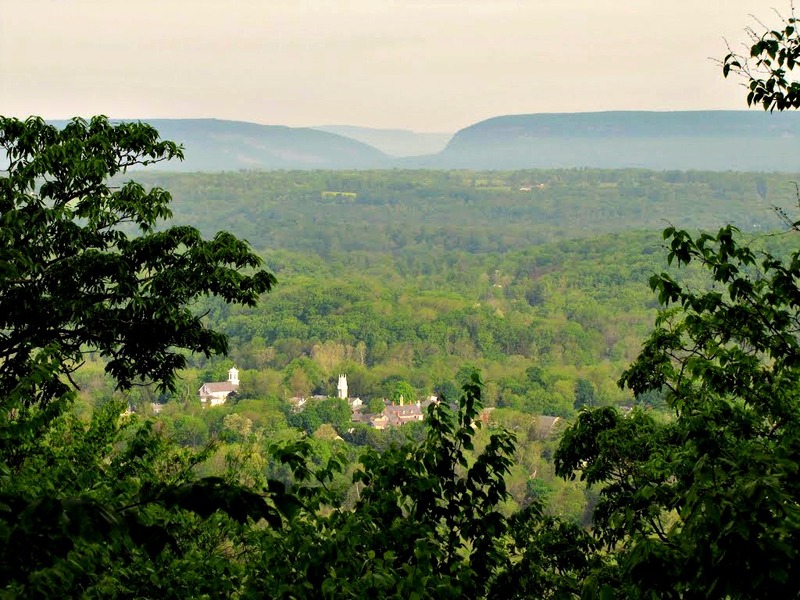 This area is the heart of the famous Pennsylvania anthracite coal region. I won’t do too much geology (don’t worry). But as you all remember from your Earth Science class, there are basically two types of coal: bituminous (or soft) coal and anthracite (or hard) coal. Sorry about the poor quality, but note how the the light blue beds mirror the anthracite and bituminous fields? 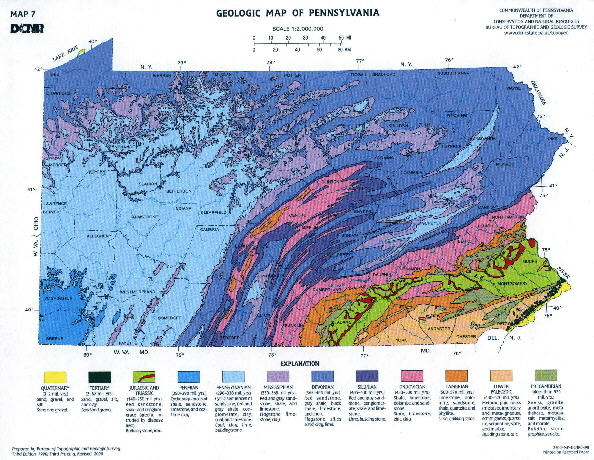 These are the Pennsylvanian-aged rocks in the state (laid down about 300 million years ago). 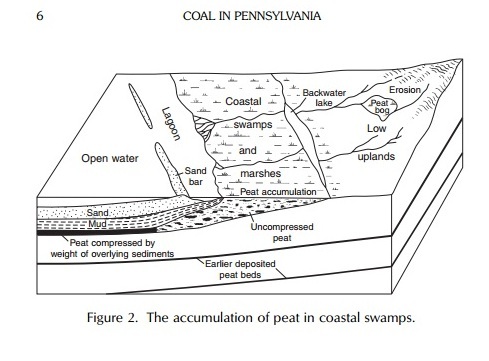 And yes, the Geologic Period known as the Pennsylvanian was named after the coal beds in Pennsylvania! In the middle-to-eastern part of the site, the strata were folded (as I mentioned in my water gap discussion earlier), forming the Valley-and-Ridge province. 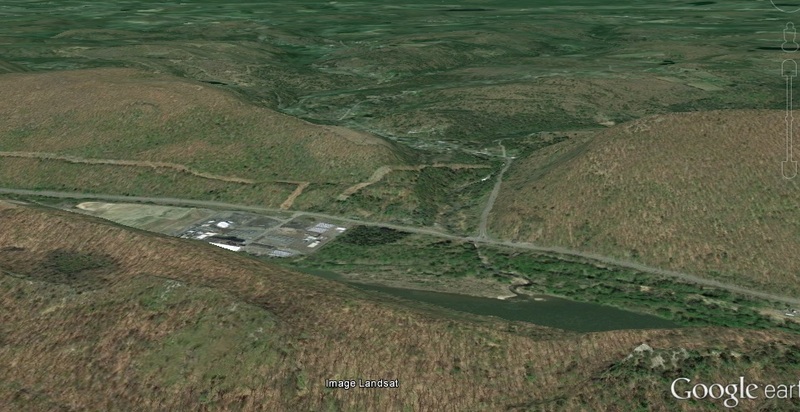 The anthracite coal fields are a small part of this folded belt. 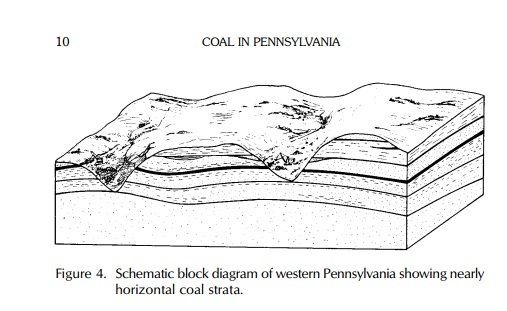 So why aren’t there more extensive anthracite coal fields (and more Pennsylvanian-aged beds) in the central part of the state, you might ask yourself (although you probably didn’t). 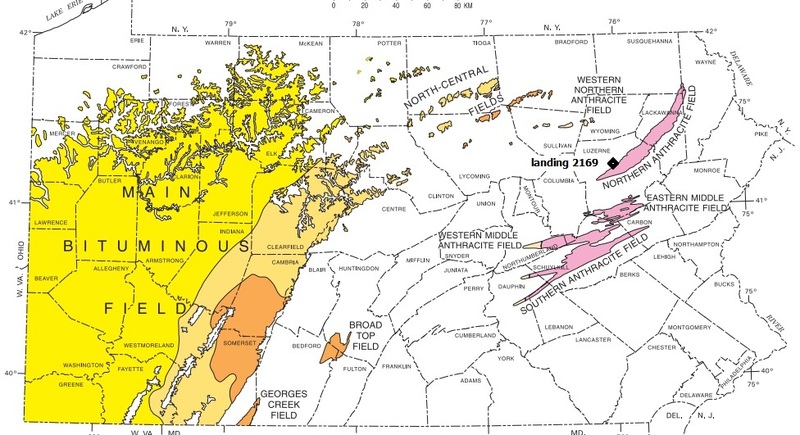 Well, it turns out that most of the coal beds of the Valley and Ridge (folded) province were eroded away during the tens of millions of years that the region has been subject to erosion, and much older rocks are exposed. 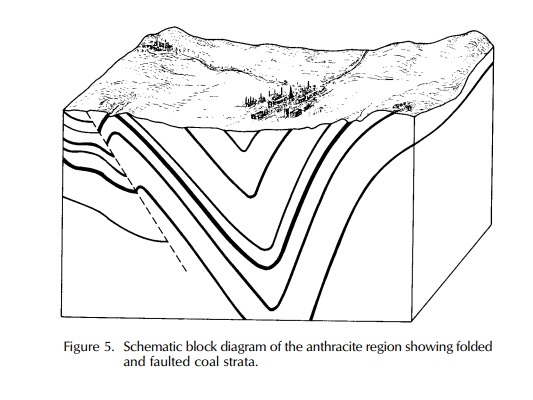 So why are the folded coal beds hard anthracite coal? Because they were subject to more intense pressure & temperature during the whole folding process, and these higher temperatures and pressures squeezed and baked (metamorphosed) the coal beds, changing what would have been bituminous coal into anthracite coal. Anthracite is better quality coal, with fewer impurities; most importantly, it produces more energy per ton when burned than bituminous. It helped fuel the industrial revolution along the east coast in the late 1800s. 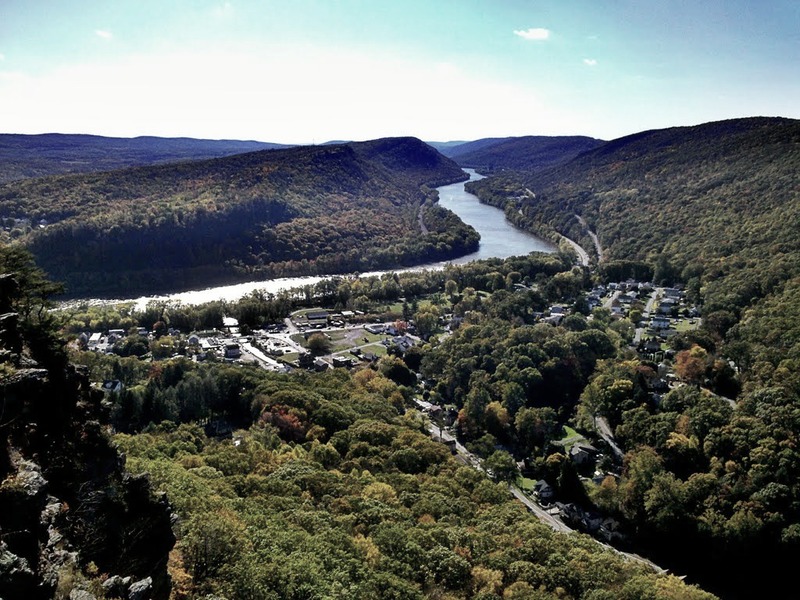 Believe it or not, over 95 percent of the Western Hemisphere’s supply of anthracite coal comes from northeastern Pennsylvania. The Great Depression of the 1930s hit the region particularly hard, and the primary market for anthracite, the urban northeast, turned to cheaper fuel alternatives such as oil and natural gas. Anthracite tonnage by 1938 was 46 million, less than half the tonnage of twenty years before. With fewer and fewer jobs in the anthracite industry, sons no longer followed their fathers into the mines, businesses closed and communities began to empty. This trend was also fueled by the limited availability of anthracite coal, also considering that the folded coal beds can extend too deep for economically-viable production. By the later decades of the twentieth century, the once booming coal region had become economically depressed, slowly coming to terms with the most recent chapter in the anthracite story: the painful deindustrialization process that many Pennsylvania towns and cities continue to experience. Phew. How about poor ol’ Nanticoke? Well, I couldn’t find much of interest, except its coal mining past. However . . . drum roll please . . . I did stumble on Nanticoke’s own . . . CONCRETE CITY! 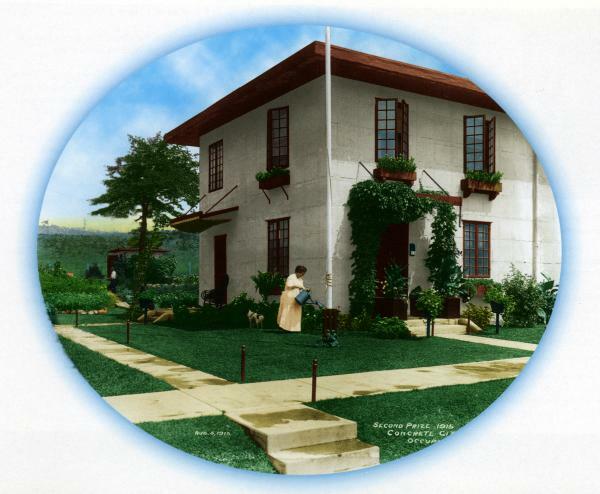 “Company housing” was not uncommon in Pennsylvania in the late 1800s and early 1900s, but the term usually referred to crowded, substandard wooden houses, hastily built by wealthy industrialist owners for their low-paid workers. The Pennsylvania Railroad was notorious for its inferior company housing, and many new immigrants and American-born laborers came home from grueling twelve-hour shifts to poorly built dormitories and houses little better than shacks. In the early 1910s the DL&W (Delaware, Lackawanna & Western Railroad) decided to build model worker housing near Nanticoke. Determined to combine the latest technologies with the best notions of progressive social thinking, railroad authorities decided the houses would be built of concrete. 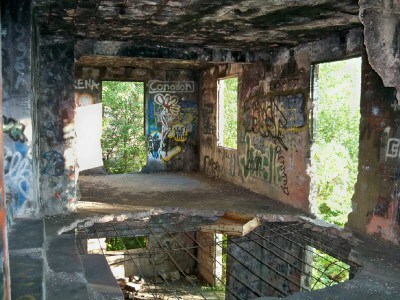 Extolled by its designers as the “Garden City of the Anthracite Region,” Concrete City was built in 1911 to house only a select few of DL&W’s Truesdale Mine employees. Prospective tenants had to speak English as their first language, and also had to be employed in positions of “high value,” such as foreman, shopman, or technician. 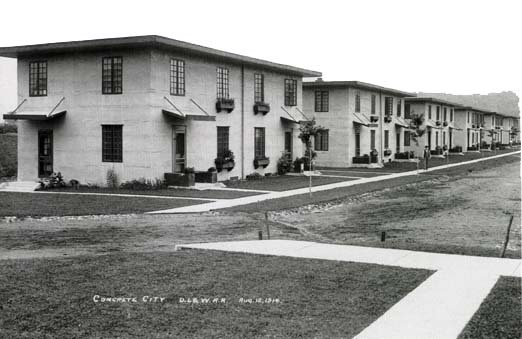 The grandly named Concrete City was in actuality a square of twenty double houses. Only forty of the Truesdale mine’s 1,700 employees would receive a spot in the wondrous new community, which featured sidewalks, electric street lights, a concrete swimming pool, playgrounds, a baseball field, and tennis courts. To build this cutting edge residential complex, an innovative system of portable hinged steel molds filled by concrete poured from rail cars, allowed the company to build an entire two-family house in a single day. Each house (half of a double) rented for $8 per month, and had seven rooms: living room, dining room, and kitchen downstairs, with four bedrooms above. A coal stove between the living and dining rooms provided heat, as did a coal cook stove in the kitchen. Concrete outhouses, complete with coal bins, were located in the rear of each house. The Concrete City homes, however, never lived up to the hopes of their builders. The interior walls dripped with condensation – one former resident recalled that her father’s shirts froze in an upstairs closet during the wintertime, and her mother had to iron them every morning just so he could put them on. By 1920, paint and plaster were peeling from the walls. 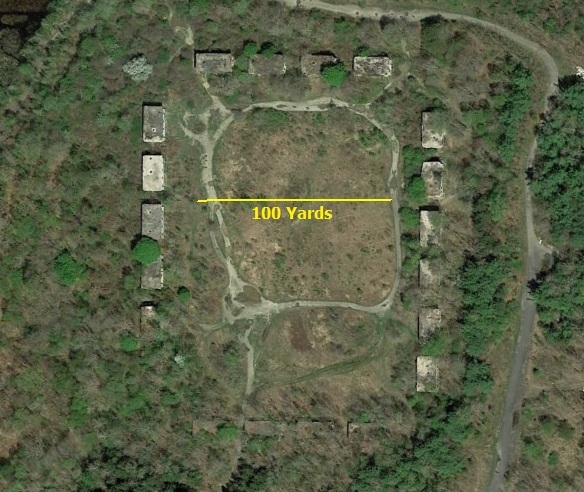 By 1924, a mere eleven years after its construction, Concrete City was abandoned. Demolition was halted after it was discovered that the emplosion of 100 sticks of dynamite in one of the buildings had little impact. Recently, the Pennsylvania Historical and Museum Commission has undertaken a mission to save the buildings, recognizing their important role in one of the failed technological experiments in Pennsylvania railroad and coal mining history. Click HERE to check out her blog post. She also produced a well done Vimeo video (highly recommended). This entry was posted on April 4, 2015 at 1:50 pm	and is filed under Uncategorized. Tagged: anthracite coal, concrete city, Delaware Water Gap, Hunlock Creek, Nanticoke PA, Nanticoke Pennsylvania, Susquehanna River, water gaps. You can follow any responses to this entry through the RSS 2.0 feed. You can leave a response, or trackback from your own site. Great post! 2 for 2 on geology and hook (concrete city).